Click here for a link to the on-demand webinar. *NOTE: This 2 hour webinar is MODULE 10 Part IVand can be taken as a stand alone course or as part of the professional yoga therapist designation (PYT). What is the PYT designation? The PYT designation is a 15 module certification program for health care professionals in medical therapeutic yoga. Allied Health Education currently offers Modules 1 – 7 & 10 parts 1 & 2 as on-demand webinars under our on-line, self-study course offerings. Modules 8 & 9 are live, on-site courses. Modules do not have to be completed in order. If you think you might be interested in earning your PYT designation or would like to learn more please contact Ginger Garner at www.gingergarner.com andwww.professionalyogatherapy.org. Identify five points for diagnosis and intervention in evidence based conventional rehabilitation of the ITB in order to understand the integrative model of medical therapeutic yoga in the PYT method. Describe four critical factors for implementation of multi-faceted integrative therapeutic programming for iliotibial band syndrome (ITBS) and patellofemoral (PF) considerations using the pentagon of wellness conceptual model. List the three postures necessary to facilitate completion of the acute and subacute ITBS programming in medical therapeutic yoga. Critically analyze yoga postures and breathing techniques in a case study format in order to prescribe intervention for extrinsic risk factors in prevention or management of ITBS and PF considerations. Identify the 2 categories for differential diagnosis of the hip and the 5 evidence based risk factors for intra-articular hip labral injury in order to understand how intra-articular hip joint injury could be avoided. Describe the morphological classification system of labral tears in order to identify the most accepted provocative tests used in identification of intra-articular hip joint injury. Discuss current evidence based medical management, including surgical intervention, for labral tears and related secondary injuries of the hip. 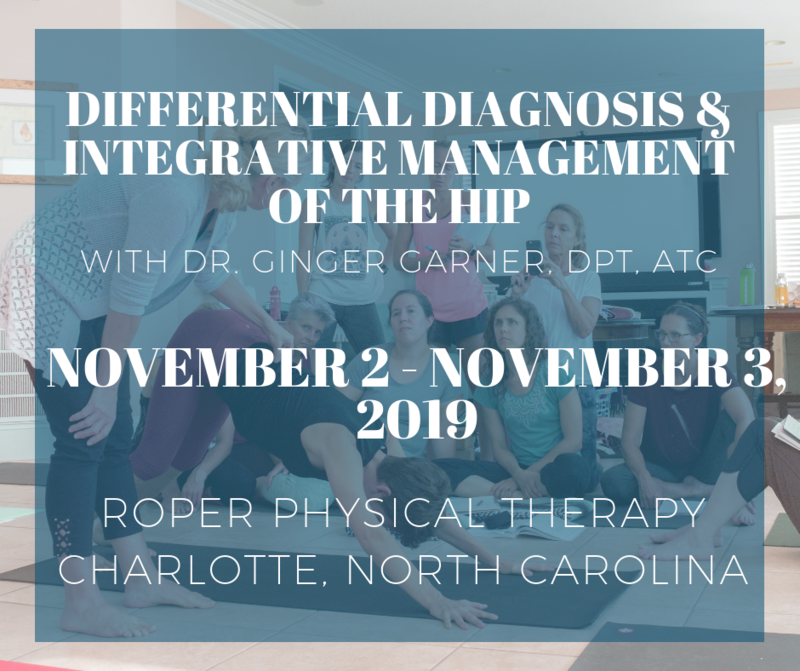 Ginger is an integrative physical therapist, licensed athletic trainer, and founder of Professional Yoga Therapy Studies, an organization providing curricula andcompetencies for using yoga in medicine. Ms. Garner advocates for Americans to receive holistic and integrative medical care in order to improve health and health care in the US. Her clinical fields of focus include public health education, orthopaedics, chronic pain, and women’s health. Ms. Garner has been teaching, writing, and lecturing for hospitals, clinics, and universities throughout the United States since 2000. Her medical yoga graduate and post-graduate programs teach non-dogmatic, evidence-based care through fostering an east/west multi-disciplinary team approach. They are a first of their kind in the United States.